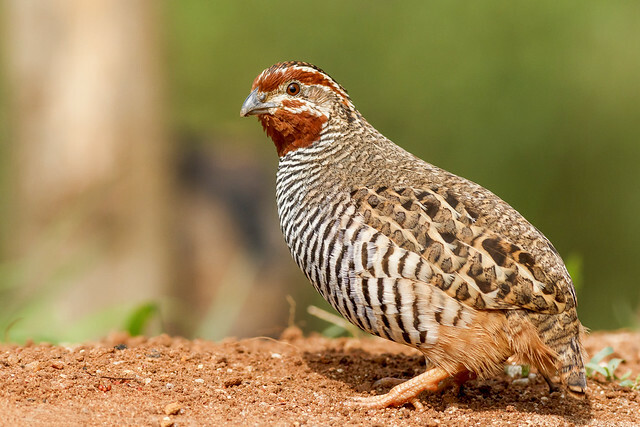 The jungle bush quail, or Perdicula asiatica is a species of quail found in Indian Subcontinent, ranging across India, Nepal, Pakistan and Sri Lanka. In India it has been photographed in Jamwaramgarh Wildlife Sanctuary, Jaipur District, Rajasthan, Masinagudi, The Nilgiris District, Tamil Nadu, Chitadurga, Karnataka, Amravati, Nagpur, Kolkata and many other cities of India. As per Conservation status is Least Concern (IUCN 3.1). The males and females are quite different, the male has white mustache, heavily barred white underparts, and variegated wings. The female has a uniform, rich chestnut breast and belly. The jungle bush quail is largely sedentary, although the birds in Nepal are thought to migrate in winter. Usually they can be spotted while the group is crossing from one bush to the other.